Like many dSLR cameras, the Nikon D3400 offers Live View, a feature that enables you to use the monitor instead of the viewfinder to compose photos. Turning on Live View is also the first step in recording a movie; using the viewfinder isn’t possible when you shoot movies. To shift to Live View mode, press the LV button. You hear a clicking sound as the internal mirror that normally sends the image from the lens to the viewfinder flips up. The viewfinder goes dark, and the scene in front of the lens appears on the monitor. To exit Live View mode, press the LV button again. 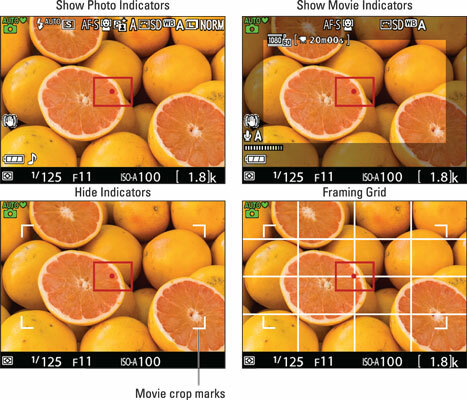 Show Photo Indicators: Reveals extensive shooting data for still photography. The camera uses this display mode by default. Show Movie Indicators: Displays data related to movie recording, as shown in the upper-right screen. At some recording settings, including the default movie resolution and frame rate, a crop frame (gray borders) appears to show you how much of the screen area will be included in the movie. Hide Indicators: Displays only the basic shooting data shown in the lower-left example. The gray movie-crop frame is replaced by four corner markings. Framing Grid: Adds a grid and the movie-crop framing marks. Cover the viewfinder to prevent light from seeping into the camera and affecting exposure. You can cover the viewfinder with your hand or a small piece of paper or you can invest in an official Nikon eyepiece cover, which has the part number DK-5 and sells for under $5. This same practice is suggested for self-timer photography or other occasions in which your eye won’t be on the viewfinder when you take the shot. The monitor turns off by default after 10 minutes of inactivity. When monitor shutdown is 30 seconds away, a countdown timer appears in the upper-left corner of the screen. You can adjust the shutdown timing via the Auto Off Timers option on the Setup menu. Using Live View for an extended period can harm your pictures and the camera. In Live View mode, the camera heats up more than usual, which can create the proper electronic conditions for noise, a defect that gives your pictures a speckled look. Perhaps more importantly, the increased temperatures can damage the camera. For that reason, Live View is automatically disabled if the camera detects a critical heat level. In extremely warm environments, you may not be able to use Live View mode for long before the system shuts down. When the camera is 30 seconds or fewer from shutting down, the countdown timer appears to let you know how many seconds remain for shooting. The warning doesn’t appear during picture playback or when menus are active, however. Aiming the lens at the sun or another bright light also can damage the camera. Of course, you can cause problems by doing this even during viewfinder shooting, but the possibilities increase when you use Live View. You can harm not only the camera’s internal components but also the monitor (not to mention your eyes). Press the Info button to change the Live View display data.